This tried and tested 2 Louver grey precast concrete walling pattern will give you privacy and security at an affordable price. These steel reinforced Louver precast concrete walls come at a more affordable price than the double sided brickcrete walls. The grey precast walling can be painted with a good quality cement- or roof paint to match the colour of the house or garden. 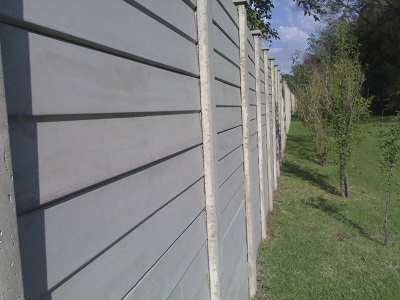 The solid precast vibracrete walls are ideal for privacy and keep intruders from seeing inside. Concrete precast reaches a strength of 28mpa after 30 days. 2 Louver Panels: 2 x 3.15mm spring spring steel. Foundation: 350mm x 350mm 15 Mpa concrete & poles are planted 550 to 600mm deep. All precast concrete panels are grouted top to bottom.